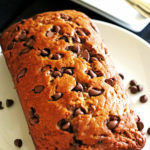 This Chocolate Chip Banana Bread is so moist and delicious. The flavors of the banana and chocolate go so well together! The best bananas for baking banana bread with are when they are very ripe. I remember when I was dating my husband, his mom would often have the ripest bananas I had ever seen sitting in her kitchen. She would tell me they were for her banana bread. I wasn’t too sure on that as a younger self and not spending too much time in the kitchen at that point in my life. But, you know that saying, “Mother knows best”…well it turns out that is true. 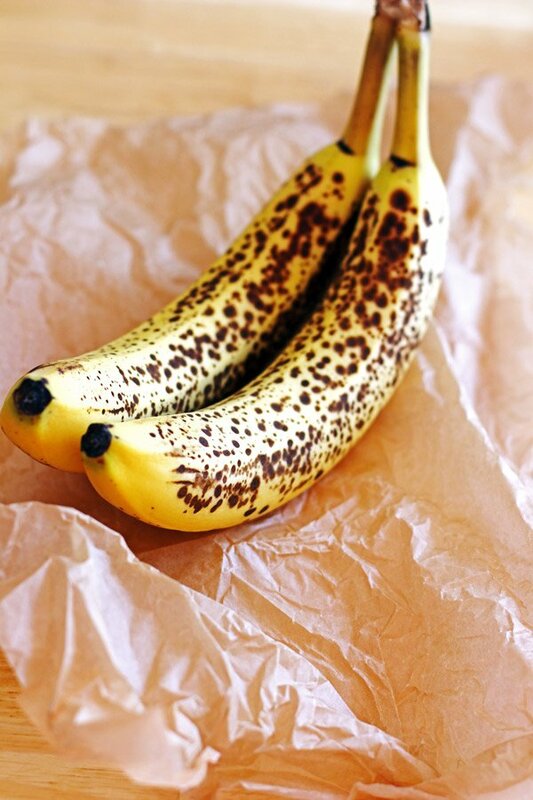 :o) Not only are bananas great to bake with, they have many great health benefits. A ripe banana contains good amounts of dietary fiber, vitamin C, potassium, vitamin B-6 and antioxidant compounds. So let’s get baking with those ripened bananas! Are your bananas not ripe enough? Here’s a tip for you. Place them in a brown bag and they will ripen up faster. So once your bananas are ripened, you are ready to go. This recipe is very quick and easy to make. 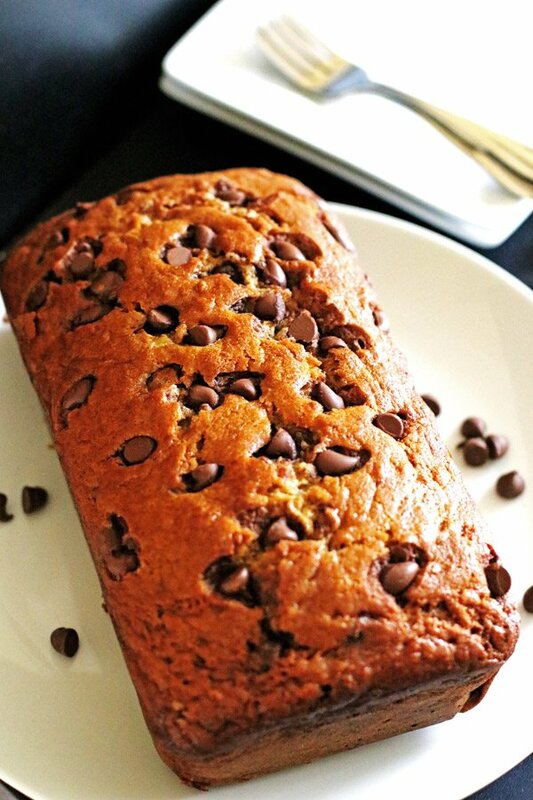 And…banana bread is versatile as it can be a dessert, breakfast or a little after school treat. Take your butter and eggs out ahead of time so they are room temperature. Preheat your oven to 350 degrees. Either line your 9×5 loaf pan with parchment paper (grease any areas that are not covered) or generously grease your loaf pan. Combine the flour, baking soda, baking powder, salt and cinnamon in a bowl. Beat the butter and sugar until light and fluffy. Add the eggs, adding one at a time and beating after each one is added. Mix in the mashed banana, milk and vanilla. Mix just until ingredients are combined. Stir in the chocolate chips. Pour the batter into your prepared loaf pan. Preheat oven to 350 degrees. Line your 9x5 loaf pan with parchment paper, greasing the areas that are not covered with the paper. If not using parchment paper, generously grease the loaf pan. Mix together the flour, baking soda, baking powder, salt and cinnamon in a bowl. Set aside. In a mixing bowl, beat the butter and sugar together until light and fluffy. Add in the eggs on at a time, beating after each one is added. Add in the mashed banana, milk and vanilla. Combine the dry ingredients to the banana mixture. Mix just until combined. Add in the chocolate chips. Bake until toothpick comes out clean, about 60 minutes. Cool slightly before serving. Banana bread is the best!! 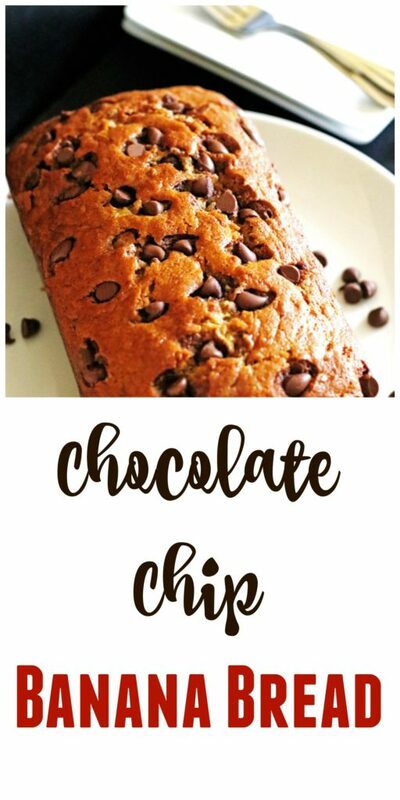 & with chocolate chips it’s simply awesome 🙂 This looks amazing!